Bushnell is at it again, taking distance measuring technology to the next level with the launch of its Pro XE Golf Laser Rangefinder. The incredible device is tour-tested and uses a number of state-of-the-art features to ensure golfers get exactly what they need, when they need it most. Read on to find out more. With the new Pro XE, temperature and barometric pressure have been added to the brand’s patented Slope technology, to offer players the most precise compensated distances ever. By using a new “slope” algorithm, the device is able to take into account the most up-to-date ball flight measurements, giving golfers a much sharper angle of descent over the previous algorithm. The Pro XE also features an all-new PinSeeker with Visual JOLT Technology. A red ring flashes as JOLT vibrates to give players even more feedback and confidence to help assure you that you’ve locked in on the flag. The device has the ability to lock in on flags 500+ yards away! Bushnell is the number one laser rangefinder in professional golf, with more than 99.3% of PGA Tour pros using the brand. With the new Pro XE you can easily make your device tournament legal by simply switching off the slope technology. It’s impressive waterproof construction also features the brand’s incredible BITE Magnetic Mount. This built in technology allows golfers to easily attach the Pro XE straight onto their cart or trolley for total convenience. 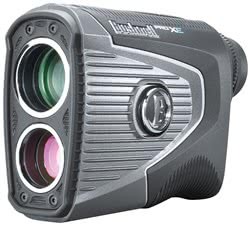 The Bushnell Pro XE is available to buy now from GolfOnline.